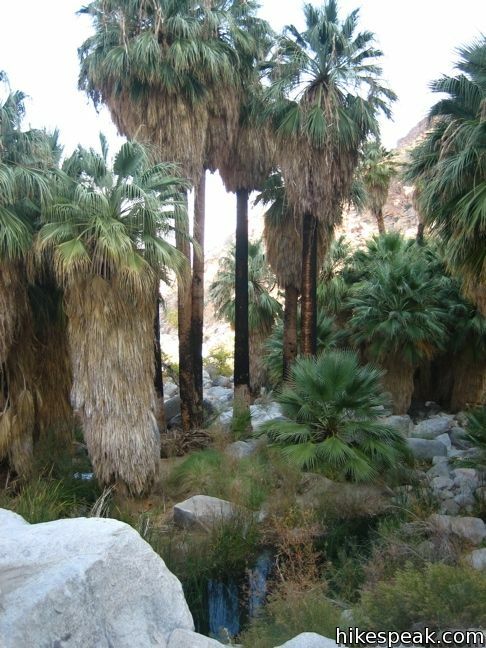 A secluded palm tree oasis is tucked away on the north end of Joshua Tree National Park. 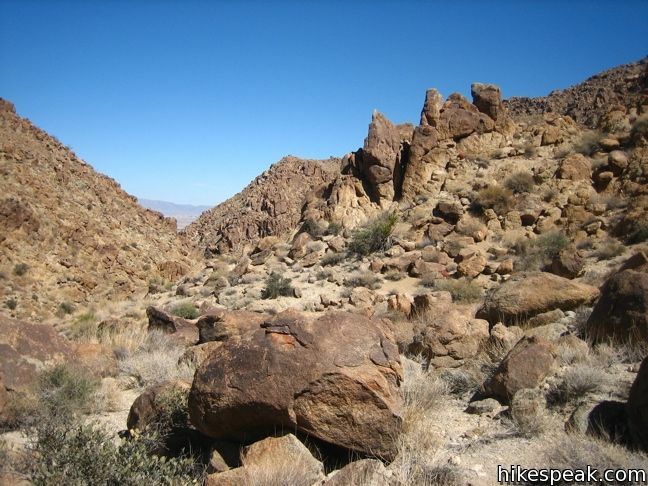 To reach the awesome oasis, you’ll hike 3 miles round trip with 350 feet of elevation gain, passing through a variety of desert scenery and panoramic views. 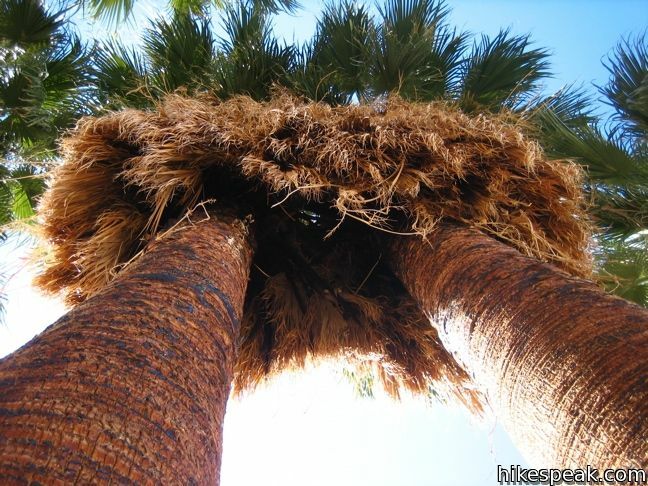 The trail leads to a collection of palm trees wrapped around a rare spring, an out-of-place desert destination that’s a perfect target for hikers. 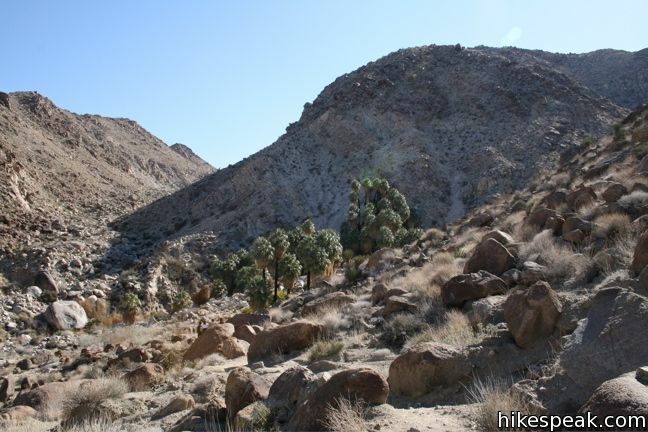 The trail to Fortynine Palms Oasis is located away from Park Boulevard (the main road through Joshua Tree National Park). 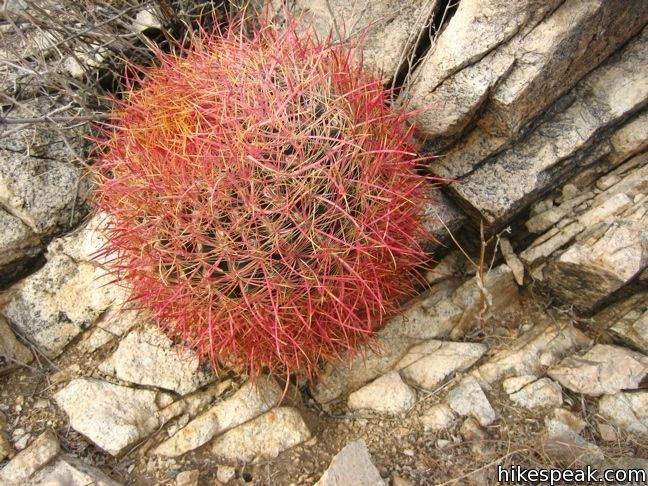 This reduces the number of hikers this trail receives. 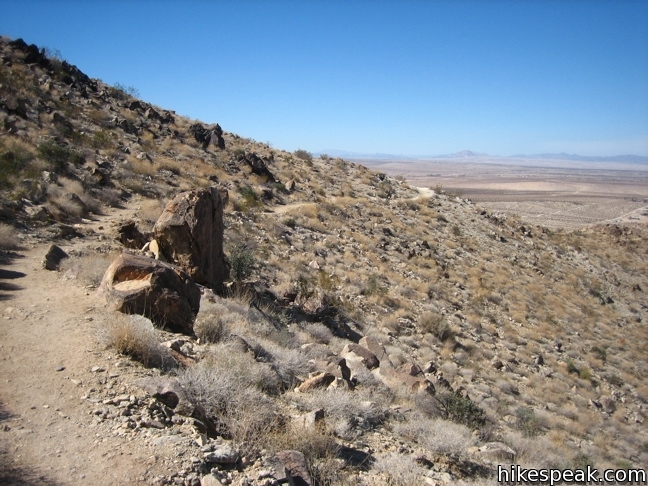 The trail has a separate access road into the national park with no ranger station. 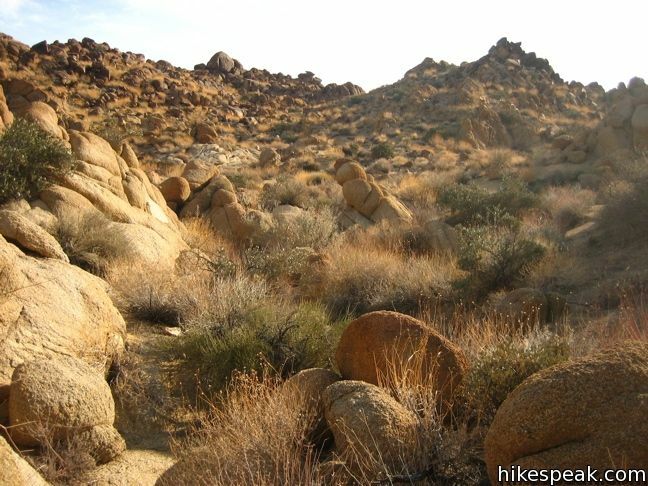 This is an added bonus for anyone passing through the high desert who would like to go on a great hike in Joshua Tree National Park without paying an entrance fee. The trail heads uphill from the start on a well maintained single track. 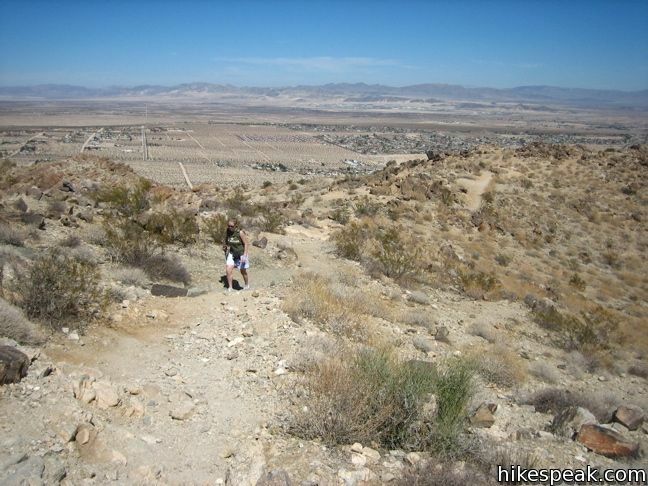 Each step increases the view of the surrounding desert. Red Barrel cacti line the trail. 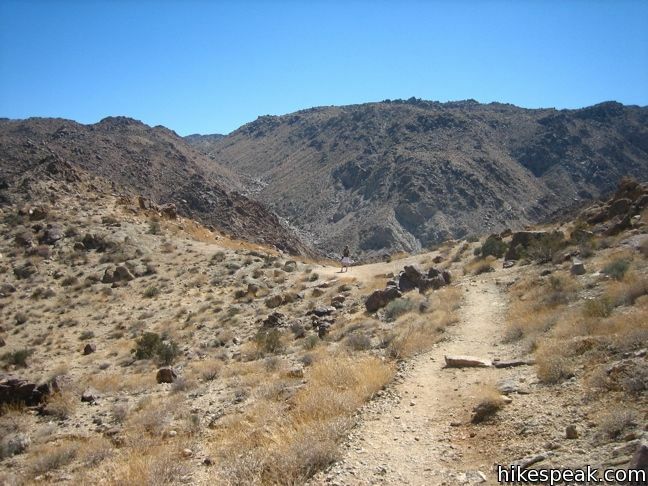 At the half way point, the trail begins descending toward the oasis. 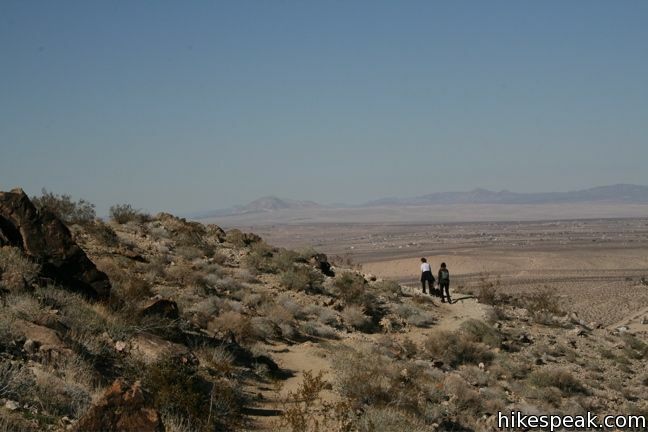 Enjoy grand views across a Fortynine Palms Canyon. As you look down the trail, palm trees appear in the distance, appearing bizarrely out of place from the surrounding arid landscape. The trees were planted by miners to mark the spring that now irrigates the trees. 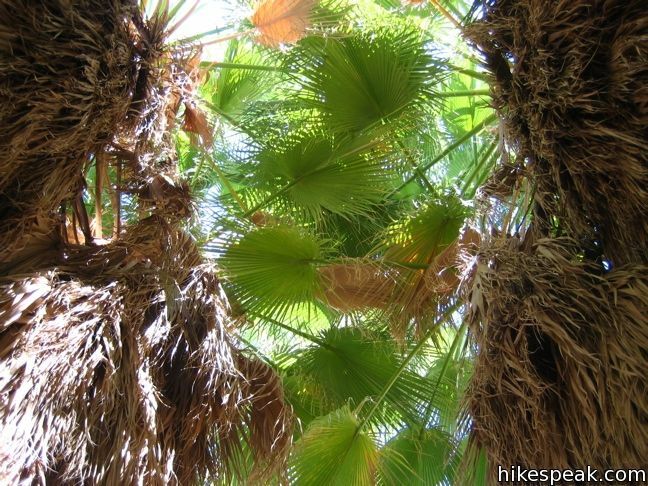 The trail ends when you reach Fortynine Palms Oasis, where fan palms rise up between large boulders. Sit beside small pools of water in the shadow of the palm trees and ponder what it must have been like back then, wandering through the desert with an empty canteen. Bring a picnic lunch to Fortynine Palms Oasis and stay awhile, listening to the birds chirp at this out-of-place oasis. 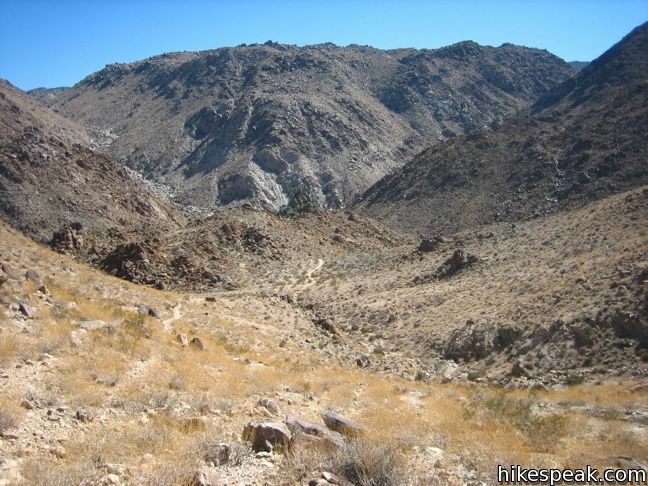 This three mile venture is a great desert hike (even if there are no actual Joshua trees to be seen). 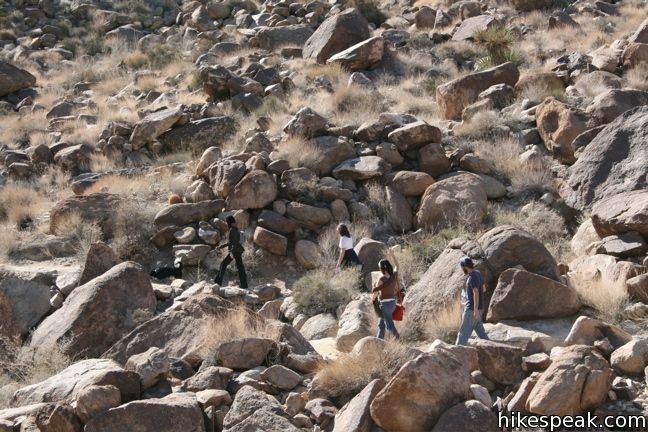 No permit is required for the hike to Fortynine Palms Oasis. 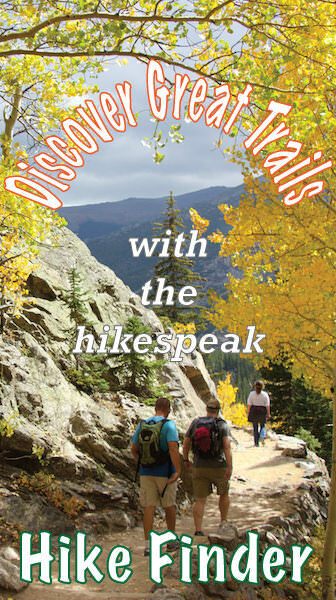 The trail is free to access, so get out and enjoy! 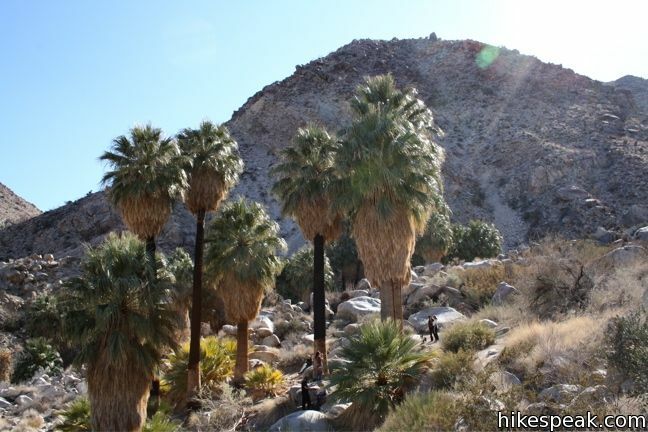 If you’d like a longer hike to another palm tree oasis in Joshua Tree National Park, check out Lost Palms Oasis on the east side of the park. 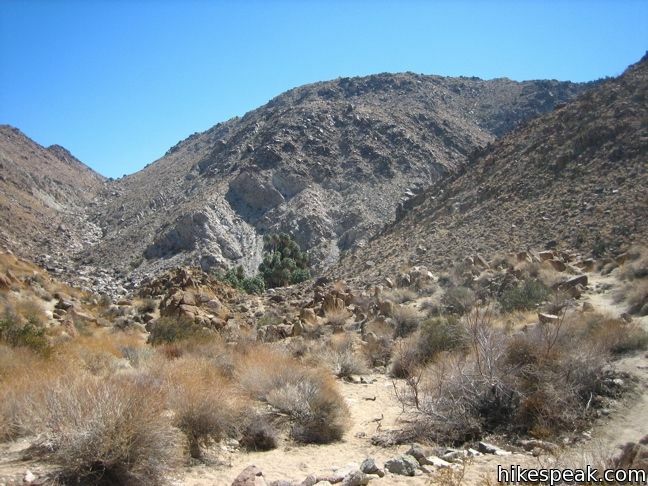 To get to the trailhead: From inside the park, exit the north entrance and make a left on Route 62. 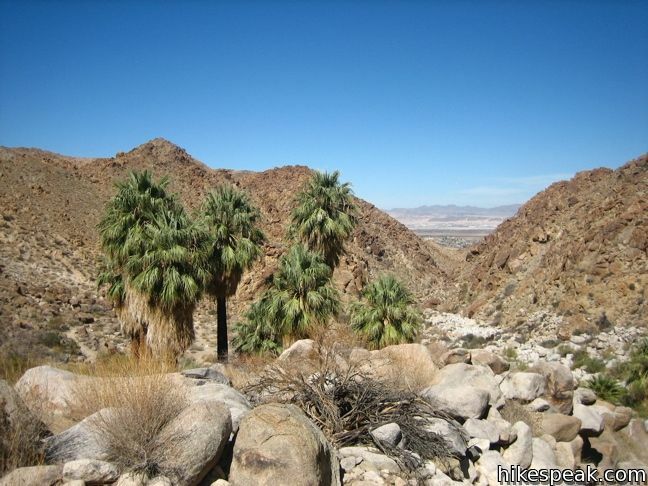 Drive 5 miles through the city of Twentynine Palms (They love counting palm trees in the desert) and turn south on Canyon Road. Drive 1.7 miles to the parking lot at road’s end. These photos were taken in November of 2006, March of 2007, and January of 2008. Click to enlarge. 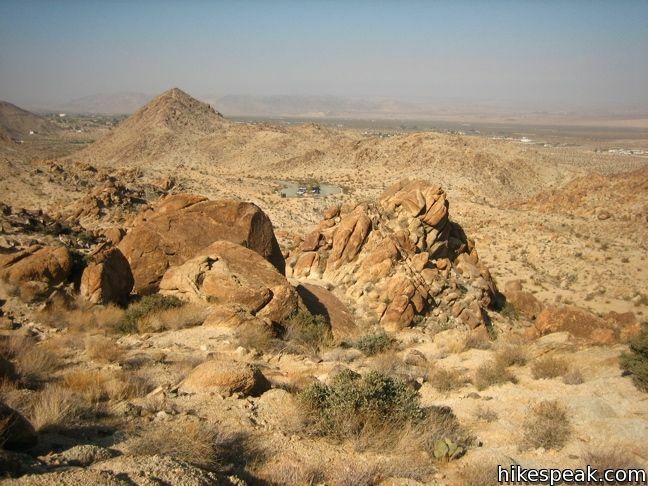 I’m planning a trip with a group of guys to go hike up to fortynine palms Oasis and was wondering if it is open? I have seen on some websites that it is closed and some say it is open? It is marked with signs saying it is closed for “emergency conditions” (heat and drought, I think) and to allow wildlife access to the stream without human interference. 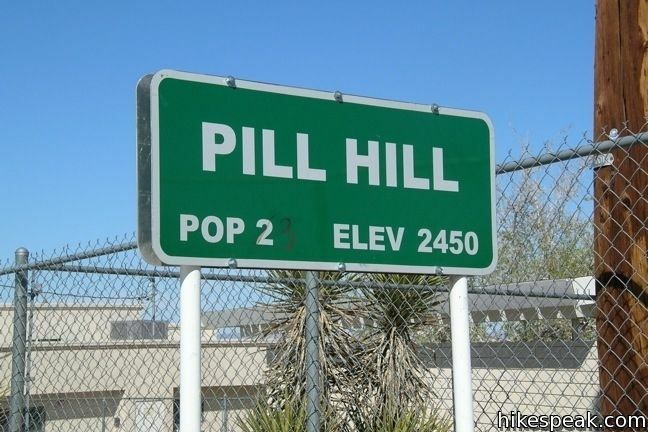 The sign states that violation may result in up to $6000 fine or 6 months jail time. 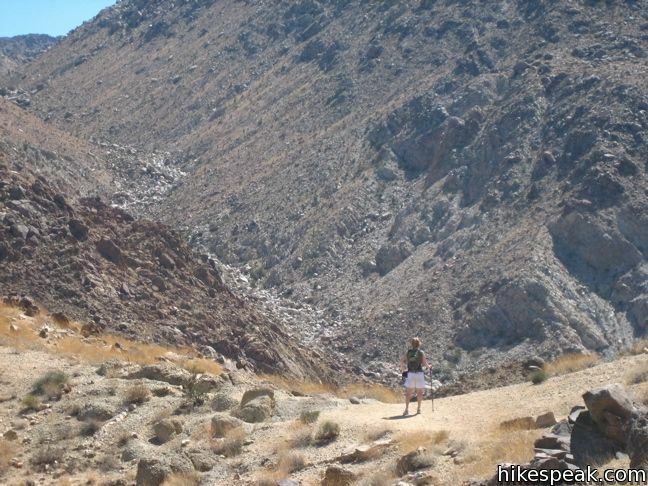 According to some locals, the closing may be related to an incident in which a hiker had to be rescued from the trail. 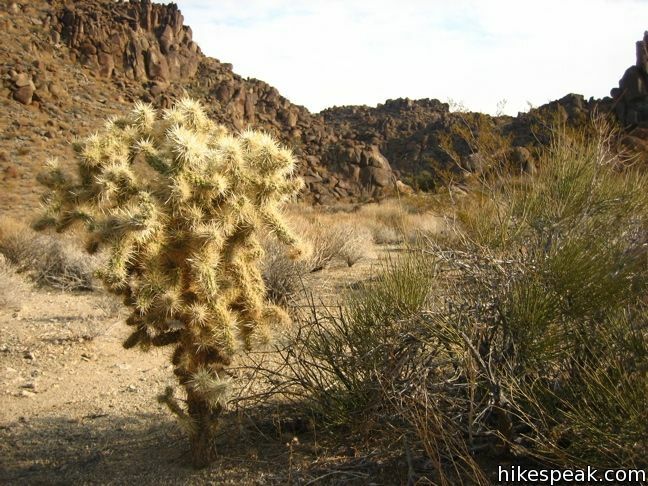 These incidents are not uncommon among desert trails as inexperienced hikers come to hike the trails without enough water. The sign does not indicate how long it’ll be closed. Thanks for the hike description. About how long did it take you? I’ve done this hike a few times. It can be completed in 60-90 minutes, depending on how much time is spent at the oasis. Other hikers have commented that this trail may be temporarily closed, so you may want to check with a park ranger before heading to the trailhead.